Nothing says summer quite like ice cream, along with its extended family of frosty treats. From green chile–topped frozen custard in Las Cruces to classic soft-serve in Aztec to scooped red chile–chocolate ice cream in Santa Fe, only–in–New Mexico frozen desserts pair perfectly with Southwestern dry heat. Common among the state’s purveyors is a deep commitment to local ingredients, including pistachios from Eagle Ranch, in Alamogordo, lavender from Abiquiú’s Purple Adobe Lavender Farm, and regional honey and fruit. New Mexico milk and cream are key ingredients, supplied by the likes of Albuquerque-based Rasband Dairy. Since local ingredients are seasonal, flavors are subject to availability. If you see a flavor that you like, you’d better enjoy it lickety-split. Here’s the scoop on where to score the best chilled treats. 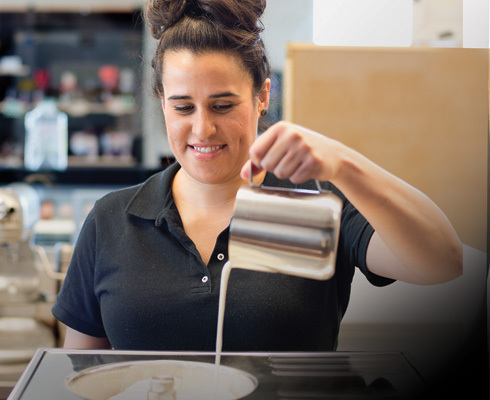 Owner Nicole Maes-Gonzales mixes milk, cream, sugar, and eggs to make the ice cream base at Cloud 9 Creamery. Caliche’s has inspired an almost cult-like following for its dense, creamy custard, served out of neon-lit storefronts. Dress up the chocolate or vanilla custard by ordering New Mexico–themed green chile or cherry-chipotle sundaes. Free “poochie” cones for pets! Equally beloved by locals and tourists, Classic’s sells custard from a walk-up window. Vanilla and chocolate custards are the base of infinite flavor variations that can be created with toppings and mix-ins. Order a decadent sundae or try the “Alien Ice” (aka sorbet), which comes in flavors like blue raspberry, coconut, and wild cherry. This fairly small operation shares a retail space with CoCopelli Chocolatier in Santa Fe. Owner Nicole Maes-Gonzales wanted to bring a family-friendly ice cream shop to Santa Fe, and she’s done it, with small-batch ice cream that delights kids and adults alike. Order the incredibly creamy Santa Fe piñon, honey-lavender, or pistachio ice cream, all made with local ingredients. The chocolate aroma hits before you even walk in the door of the dollhouse-like adobe building that houses a wonderland of chocolate and spectacular ice cream. Although owner Tony Bennett says that salted caramel and citrus–pistachio are quite popular, chocolate is the fave. (Latin American popsicles) are the main event here: They come in more than 40 varieties, ranging from creamy to fruit-based and even chocolate-covered. Try the sweet and fiery watermelon-chile. The interior may resemble a groovy spaceship, but this is a business with deep local roots. Owner Paula Pope is a tenth-generation New Mexican. Educated at UNM, she studied biology before pursuing a life of fro-yo: “Biology, bacteria, yogurt—it’s all related, right?” The menu features locally inspired flavors, including White Sands Vanilla, Chacoholic (as in Chaco Canyon), and Mora Ranger Raspberry. Founded in 1993 by ski bum Jamie Leeson, Taos Cow is a cult fave housed in a funky building in the artsy hamlet of Arroyo Seco. Leeson uses local and organic ingredients whenever possible, and rBGH-free milk and cream from Rasband Dairy. Order the piñon-caramel, cherry ristra (cherry, chocolate, and piñon), or lavender. You’ll feel like you stepped back in time when you visit this charmingly retro Four Corners establishment. Order one of the sundaes, served in red-and-white-checked takeaway boxes; try the green chile sundae for New Mexican flair. Free cones for babies and dogs! Just sweet enough to veer into dessert territory, Yoberri’s yogurt retains a tartness that differentiates it from ice cream. “Classic tart” (vanilla) and chocolate soft-serve—plus other rotating flavors—are available daily at both friendly and bright locations. Employees at this locally owned business take pride in sauces such as chocolate-chile, which are made in-house. It’s possible to make these recipes without an ice cream maker. They won’t be quite as smooth, but they will still be delicious. Follow these steps: Transfer the mixture into a chilled pan, where it can lie in a shallow layer. Freeze for 20 minutes; remove. Use a spatula to loosen the edges, then whisk the partially set ice cream. Whisk vigorously for 1 minute. Return to the freezer. Repeat the freezing/stirring procedure every 20 minutes for six cycles. The mixture will be slightly thicker every time. Add flavorings on the last cycle. Transfer to a freezer-safe container for storage. Salty, rich caramel and buttery piñon are united in creamy harmony in this highly addictive ice cream, inspired by a popular flavor at Taos Cow. Configure the supplies you’ll need for cooling your ice cream: Place a large bowl in an ice bath. Have a strainer close to the large bowl. Ultimately, you’ll be pouring your ice cream custard into the bowl through the strainer to cool. Measure the cream and set aside. Measure the half-and-half and pour it into a medium-size bowl. Add the egg yolks, vanilla, and salt; whisk together until combined. Set aside. Place the brown sugar and water into a large, heavy-bottomed saucepan. Place over medium heat, shifting the pot by swirling by the handle (rather than stirring) as it heats. It will begin to bubble, first at the edges, then all over. Continue swirling it every now and again. When it begins to darken (look closely, as the mixture is already somewhat dark and it will be bubbling), remove from heat. Off-heat, slowly pour the cream into the caramel. Warning: This can result in hissing and bubbling. Don’t panic: Hardened lumps in the mixture are completely normal. Place the pan back on low heat. Stir gently but frequently, using a whisk; you’ll notice that any lumps will gradually melt. Once the mixture is smooth, remove from heat. With a whisk at the ready, pour a small amount of the hot mixture into the egg mixture you set to the side, whisking constantly while you pour so that the egg mixture can acclimate to the heat (no scrambled eggs!). Add the remainder of the mixture in a slow, steady stream, whisking all the while. Transfer the mixture back to the saucepan (no need to wash). Place it back on medium heat. Use a wooden spoon to stir until the mixture begins to thicken, five minutes or less. When the mixture has thickened to the point that it sticks to the back of the spoon, remove from heat. Carefully pour the mixture through the strainer into the bowl perched atop the ice bath. Whisk the mixture every 10 minutes or so until it feels cold. Cover the bowl in plastic; place in the refrigerator for a minimum of three hours, or overnight. After chilling, transfer the mixture to your ice cream maker; churn according to the manufacturer’s instructions. Add in the piñons toward the end of the churn, or fold in by hand post-churn. Transfer to a freezer-safe container before storing. This recipe represents a fusion of New Mexico flavors and purveyors. The yogurt base is inspired by the tart fro-yo served up at Yoberri’s in Santa Fe and Olo Yogurt Studio in Albuquerque. The honey-lavender flavoring is inspired by a flavor from Cloud 9 Creamery, in Santa Fe. Combine the honey, sugar, lavender, salt, and water in a saucepan. Heat on medium until it begins to bubble at the edges and the sugar has dissolved. Remove from heat; pour through a fine mesh strainer. Discard lavender. Let the mixture cool to room temperature. In a medium bowl, combine the yogurt and the cooled honey mixture. Stir just to combine. Chill in the refrigerator, or using an ice bath, until the mixture registers 45° F or slightly lower. Transfer the mixture to your ice cream maker; churn according to the manufacturer’s instructions. Transfer to a freezer-safe container before storing. Jessie Oleson Moore is a writer, illustrator, recipe developer, and yoga enthusiast who lives with her sweetheart and her pug, Porkchop, in Santa Fe. She has written two Today show–and Publishers Weekly–featured cookbooks, CakeSpy Presents Sweet Treats for a Sugar-Filled Life and The Secret Lives of Baked Goods. See more of Douglas Merriam’s photography at douglasmerriam.com.